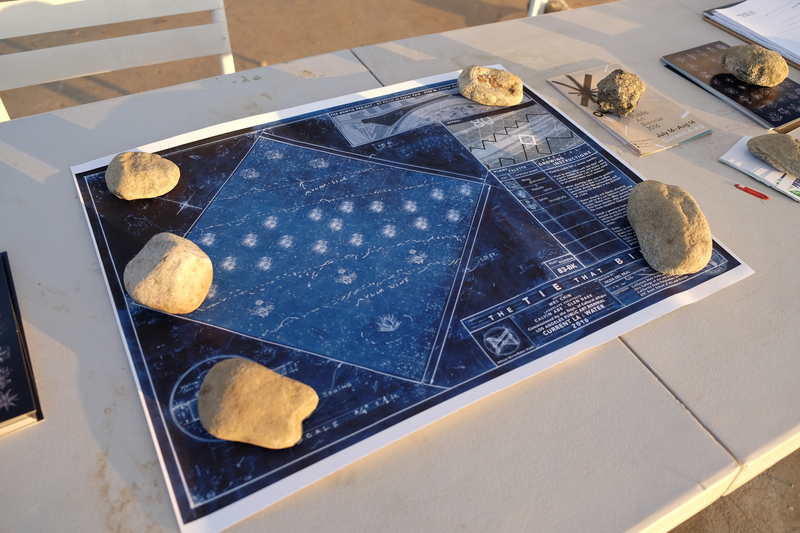 One of 512 Unique Blueprints created by the artist and team to distribute at the Field Office. Artist Mel Chin has a new Land Art project in Los Angeles, entitled The Tie that Binds. Created for Los Angeles’ CURRENT:LA Water Public Art Biennial, the project invites visitors to connect to the site of the Bowtie Project, to understand water conservation in Southern California and to join hundreds of other LA residents in owning a work of Land Art we can grow in our own yards. The Bowtie Project envisions a transformation of a stretch of the LA River. Once a railroad yard, this rare, 18-acre part of the River was left completely in its natural state, never transformed by engineers or concrete. Currently overgrown with invasive species, the site is still home to some native plant species, fish and birds. TTB plot 111-CF, Bowtie demonstration garden and South LA mirror installation. The Bowtie Project is part of a plan to restore this area of the LA River as an natural, urban state park. The Tie that Binds imagines the future Bowtie Project and the entire city sustained with water-saving, California-native landscapes. 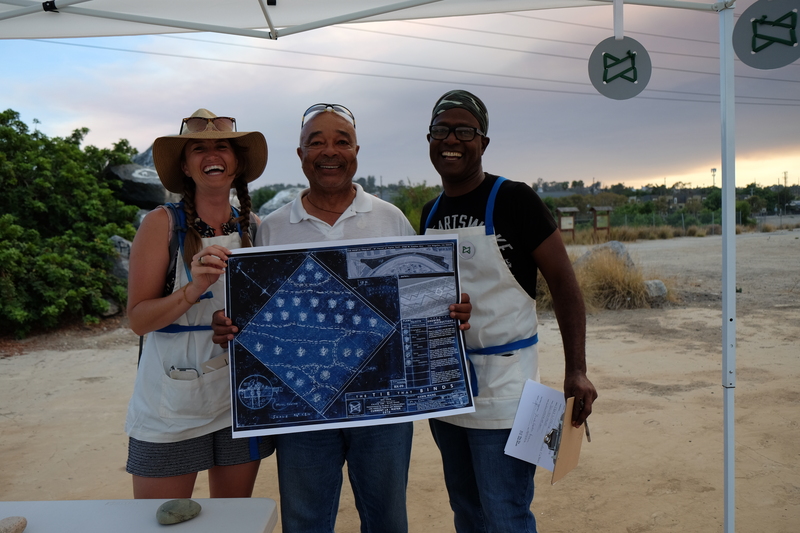 Compelled by the beauty of the site and belief that this is a place that should be owned by everyone, The Tie that Binds invites the public to “mirror” this future landscape in hundreds of individual lawns throughout Southern California. To introduce the project, eight, small Land Art gardens are planted at the Bowtie site to serve as “models”. A field office on site is staffed by “MirrorMakers/Espejeros” and is open Thursday–Sunday evenings through August 14. Private and public locations in diverse neighborhoods of Southern California have already planted exact replicas or “mirrors” of one of the Bowtie Project garden demonstrations. TTB plot 184-DJ, Bowtie demonstration garden and Brentwood mirror installation. Mel Chin invites Southern California to help realize this Land Art work. 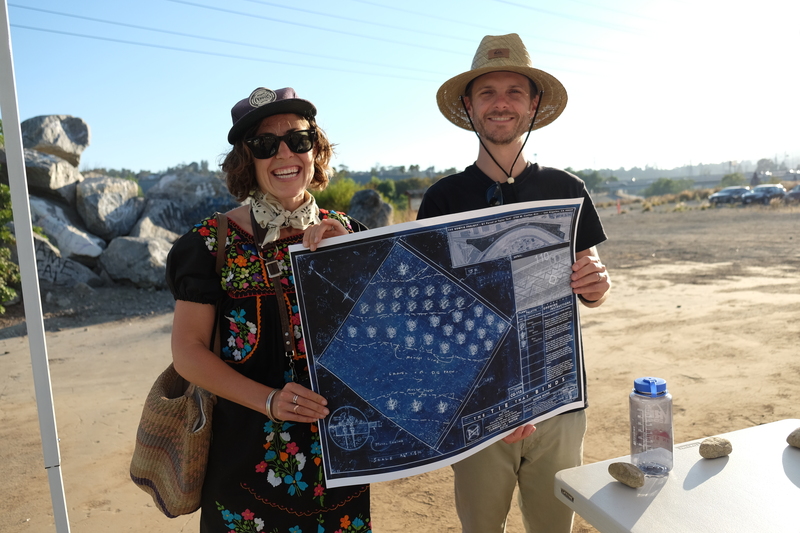 Those who commit to growing a The Tie that Binds mirror garden receive a free, unique, artist-designed blueprint, a list of native plant species, and instructions on how to grow a garden that requires little or no watering. These gardens will fulfill the potential of a living sculpture that is collectively owned by the public. Carolina Miranda wrote a wonderful article for the LA Times about the site, titled “Why Mel Chin is giving away the land art design of his subversively charming CURRENT:LA native garden.” You can see additional photos of the installation, as well as photos of the installation with Miranda’s trusty research assistant, Bonnie, the American Staffordshire Terrier. MirrorMakers Yrneh and Margo with Roger, a new Tie that Binds blueprint holder (Photo credit: Amanda Wiles, © 2016). The Bowtie Project is an 18-acre post-industrial site owned by California State Parks and is located at 2780 Casitas Ave, Los Angeles, CA, 90039. Please enter through the yellow gate and follow directions for parking. The nearly 3/4 mile site is accessed by walking; accommodations will be made for any who need assistance. The Tie that Binds field office at the Bowtie Project is open 5:30 pm until sunset, Thursday – Sunday through August 14, 2016. Mirror Makers/Espejeros are onsite to talk with visitors about the project. Mel Chin is from Houston, Texas and is known for the broad range of approaches in his art, including works that require multi-disciplinary, collaborative teamwork and works that conjoin cross-cultural aesthetics with complex ideas. He developed Revival Field (1989-ongoing), a project that pioneered the field of “green remediation,” the use of plants to remove toxic, heavy metals from the soil. A current project, Fundred Dollar Bill/Operation Paydirt, focuses on national awareness and prevention of childhood lead-poisoning through art-making. Mel is also well known for his iconic sculptures and installations, works that often address the importance of memory and collective identity, and for inserting art into unlikely places, including destroyed homes, toxic landfills, and even popular television, investigating how art can provoke greater social awareness and responsibility. The Tie that Binds: The Mirror of the Future is produced by Mel Chin in partnership with California State Parks, The Bowtie Project, and Clockshop. It is is commissioned by Department of Cultural Affairs for Current: LA Water Public Art Biennial 2016, and is made possible by the support of the Department of Cultural Affairs, The City of Los Angeles, Bloomberg Philanthropies, and the Ralph M. Parsons Foundation.